Readers of a certain age will remember, as I do, the Flanders and Swann duo who, between 1955 and 1967, put together witty evening entertainments such as At the Drop of a Hat and At the Drop of Another Hat. I played over and over again my father’s LPs of these shows, recorded live – I have them now on CD – and I pretty much learned the songs off by heart. As a schoolboy at the time I didn’t understand every last nuance but I got most of the jokes. Some of the songs have dated: for example, A Song of Patriotic Prejudice, which gently pokes fun at all nationalities other than the English, wouldn’t get past the Political Correctness Police these days. On the other hand, The Gas Man Cometh hits the bulls-eye just as accurately today while many will respond to the gentle nostalgia of The Slow Train. Michael Flanders (1922-1975) was responsible for most of the Hat lyrics and Donald Swann wrote the music. Many of the Hat songs are musically well-crafted but this new set, masterminded by pianist Christopher Glynn, sheds fresh light on the more serious side of Donald Swann. Some background information may be appropriate at this stage and for this I draw from the excellent notes by Christopher Glynn, who in his writing displays the same enthusiasm for Donald Swann’s music that is consistently in evidence through his piano playing on these discs. Donald Swann was born in the South Wales town of Llanelli and, thanks to his parentage, he had an atypically exotic background. His father, a doctor, had grown up in Russia, returning to the UK after the Revolution with his wife, who hailed from Azerbaijan. Mr Glynn tells us that music and other aspects of Russian and Transcaucasian culture were to the fore in the Swann household. While Donald was still a child the family moved to London. Young Swann attended Westminster School and towards the end of his time there he met Michael Flanders for the first time; they wrote a few humorous songs together. At Oxford after the War Swann studied Russian and Greek; one of the friendships he forged at that time was with the future Poet Laureate, John Betjeman. It wasn’t until 1948 that Swann again encountered Michael Flanders. They began to work together and put on their first performances of At the Drop of a Hat in 1955. The great success they enjoyed brought about a hectic performing and international touring schedule, all of which meant that Swann’s time for any composition work other than for their shows was seriously curtailed. It was only after the Hat partnership ceased – amicably, so far as I know – that he was able to pursue more serious compositional work. A flood of music followed including, Glynn tells us, over 600 songs. Thus, it would seem that the 46 numbers offered here, while offering a wide and excellent survey of Swann’s output in the genre, comprise only the tip of the iceberg. The selection ranges from some of his earliest songs, written in the 1940s, right through to his very last song, He wishes for the cloths of heaven, written very shortly before the composer died. One small criticism I have is that the otherwise excellent documentation isn’t as forthcoming as I’d like in telling us when the individual songs were written, though one can infer quite a lot from Mr Glynn’s notes. For instance, we’re told that in 1991 Swann published a set of songs entitled The Poetic Image. What’s not made entirely clear is that ten of the eleven songs in that volume are included on these discs (all on CD 1), namely the Hardy, Tennyson and Rossetti settings plus the songs to poems by John Clare and Oscar Wilde. The only song from The Poetic Image that’s not performed here is a setting of Wilde’s The Ballad of Reading Gaol. The two settings of words by Edna St Vincent Millay and the Emily Dickinson songs (CD1) together with the William Blake set (CD2) all come from the collection entitled Last Songs published in 2001. This information, and much more about his music, is available on the Donald Swann website. Before discussing some of the individual songs a few general comments may be in order. Firstly, the songs are unfailingly attractive. Swann had a ready melodic gift and though almost all the numbers were completely new to me I had the distinct impression that all are rewarding to sing and well written for the voice. Secondly, Donald Swann had a discerning eye for a text. He set texts of high quality and, moreover, words that readily lent themselves to musical settings. I was struck by a comment by Christopher Glynn that “the words always lead the music”. The final general comment is that the piano parts are constantly full of interest; I should imagine that they pose quite a few challenges as well, though you’d never guess that from Glynn’s fluent, vital playing. Disc one opens with a set of four songs to words by John Betjeman. These are all attractive settings and both words and music are pointed delightfully by Roderick Williams. He sings the songs with wit and with his customary sensitivity to words; indeed, I feel that he delivers these songs with as much flair and imagination as he would bring to, say, Lieder by Schubert. Not long after the publication of The Poetic Image in 1991 Swann was diagnosed with a terminal cancer. Given three months to live he reacted with determination and lived for two more years, productive until the end. The Five colourisations of Emily Dickinson were composed during this period. They’re very different to the easy charm of the Betjeman songs which I suspect were composed much earlier in Swann’s career. Farewell is accompanied by a torrent of notes while I died for Beauty couldn’t be more different; the accompaniment is sparse to put it mildly and the mainly unaccompanied vocal line has something of the character of a folk melody. I especially like the final song in the set, I had no time to Hate, which is very expressive. Felicity Lott does these songs very well. Stopping by woods is a setting of a poem by Robert Frost. The music is jazz-inflected and Kathryn Rudge sings it in a suitably smoky voice. I like this song very much; it has the air of a sophisticated cabaret song, not least in the piano interlude that precedes the final verse. John Mark Ainsley gives us the two Hardy settings. Thoughts of Phena benefits from a lovely melody and the music has an air of gentle melancholy. The Tennyson songs, Four lyrics from In memoriam, are shared equally between Williams and Ainsley which makes me wonder whether or not Swann intended them to be sung as a set. The songs are very varied and I found them all interesting. The two Rossetti settings, which are entrusted to Felicity Lott, are both very good; I particularly liked When I am dead, my dearest. This song sounds simple and direct – though I think the “simplicity” is deceptive – but the lovely music communicates very directly with the listener. An invite to eternity, sung by Roderick Williams, is a John Clare setting. Christopher Glynn describes it as “visionary”. It’s an extraordinary composition and very imaginative. The last song on the first disc is the Oscar Wilde setting, The harlot’s house of which John Mark Ainsley gives a strong performance. I’m not entirely sure I “like” the song but it’s a vivid response to Wilde’s rather frantic verses and there’s no denying that the setting is imaginative. The first disc contained exclusively settings of texts by Anglophone writers. On disc two we find some examples of Swann turning to non-English writers though with one exception the songs are written to English translations. The exception is Ya vas lyubil or ‘I loved you once’. The words are by Pushkin and Swann has the words sung first in Russian and then, almost as verse two, in English translation. This is an early song, dating from Swann’s days at Oxford University in the 1940s. Christopher Glynn suggests that the melody is one “that Tchaikovsky might not have disowned” and I couldn’t agree more. It’s a most appealing song which John Mark Ainsley sings most expressively – in both languages. He’s also very good in anther Pushkin song, She is all harmony, all wonder. This most appealing and ardently romantic piece is sung to an English translation of the words by David Marsh. Before these we hear the six Blake settings, performed by Roderick Williams. Of these Christopher Glynn comments that “there is a sense here that Blake has led Swann to more adventurous ground.” In this performance, he and Williams make the songs leap off the page. These are fascinating songs and I was especially impressed by the rather mystical fourth song, ‘The Angel’. I like the winning setting of Burns’ A red, red rose; the music is simple yet sophisticated whereas It was a lover, and his lass is a gaily infectious offering in which the music trips along delightfully. Longing is the first of a group of four songs, all entrusted to Kathryn Rudge, which use words by Leon Berger after original texts by German poets. (Berger became Swann’s archivist.) Longing is a beautiful song – with a very romantic piano part - and it’s warmly sung by Miss Rudge. Indeed, all four songs in this little group are charming and she sings them really well. I appreciate her rich tone and also her care for the words. This quartet of songs is melodically most attractive and I find Old songs of lost love particularly winning; this number seems to straddle the genres of cabaret song and art song. By contrast Raider’s dawn takes a poem by Alun Lewis (1915-1944) which expresses strong sentiments to which Swann responds with equally strong music. During his career Donald Swann set a lot of texts by Sydney Carter (1915-2004). The youth of the heart is his first Carter setting and has become one of his best-known songs. Roderick Williams inflects the words in a most engaging fashion, investing them with considerable meaning. He and Glynn use rubato in a masterly fashion. He wishes for the cloths of heaven was Swann’s very last song, composed not long before his death. `I don’t think it quite matches the exquisite setting of W B Yeats’ words by Thomas Dunhill but nonetheless Swann’s version has a fragile beauty that is most attractive, especially in Felicity Lott’s sensitive rendition. As that was Swann’s last song a strong case could have been made for placing it at the end of this collection. However, Christopher Glynn has other ideas – and rightly so. Swann became a friend of J. R. R. Tolkein and set quite a lot of his poetry to music. Bilbo’s last song is a late poem that Tolkein wrote for his secretary, Joy Hill. She gave it to Swann at Tolkein’s funeral in 1973 and he made a setting of it which is here sung as a duet by Roderick Williams and Felicity Lott. The melody is based on a Manx song and this tune is the basis for a truly memorable song. It’s a rapturous farewell and also a very touching envoi. The present performance is quite superb and it makes a moving conclusion to this wide-ranging collection of songs. 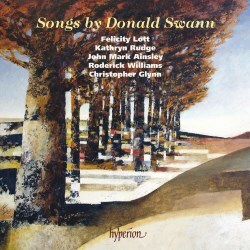 Donald Swann’s songs have been wonderfully served in these recordings. All four singers make distinguished contributions: I had the distinct impression that they greatly enjoyed this assignment. Christopher Glynn proves himself to be as persuasive an advocate for the music when sitting at the keyboard as he was when writing the liner notes. The recorded sound, engineered by Ben Connellan, is first class; he has achieved an excellent balance between the piano and the singers. The documentation is up to Hyperion’s usual excellent standard. Donald Swann’s songs may not match the profundity of, say, Finzi or Gurney but I think the songs recorded here are a significant contribution to the literature of English Song. Swann had a fine eye for a text and these songs are unfailingly attractive and often very witty. They communicate very effectively with the listener, the music enhances the words, and every song is founded upon strong melodic foundations. Throw into the mix piano parts that are ear-catching and interesting and you have a collection of fine songs. This is a captivating collection which I’ve enjoyed immensely. Flanders and Swann were a uniquely entertaining partnership but Swann without Flanders offers just as much enjoyment, albeit in a different fashion. Dare we hope for a follow-up volume?